Place a baking sheet in the oven and preheat oven to 400 degrees Fahrenheit. 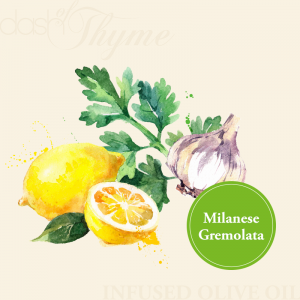 Toss the cauliflower florets with the Gremolata Olive Oil in a large bowl. Season to taste with salt and pepper. Spread in a single layer on the hot baking sheet and set the bowl aside to use later. Roast for 15 minutes. Stir the cauliflower and roast for an additional 10 minutes. Roast for 5 more minutes, and check for doneness. Continue to roast 5 minutes at a time until the stems of the cauliflower are tender enough to be easily pierced with a fork. This will take between 30 and 45 minutes total, depending on the size and freshness of your cauliflower. While the cauliflower is roasting, heat a small skillet over medium heat for 5 minutes (stainless steel or cast iron works best - try to avoid using nonstick). Add the pine nuts to the dry pan and reduce the heat to medium-low. Stir pine nuts constantly, toasting them to a golden brown color. Watch them closely so they don't burn. They should take about 5-8 minutes. Combine the lemon zest, chopped parsley, and chopped mint in a small bowl. Plate the cooked cauliflower back in the large bowl. Drizzle with additional olive oil and adjust salt & pepper if necessary. Toss with pine nuts and the herb mixture. Serve out of the bowl or plate on a serving dish.